Hi all! 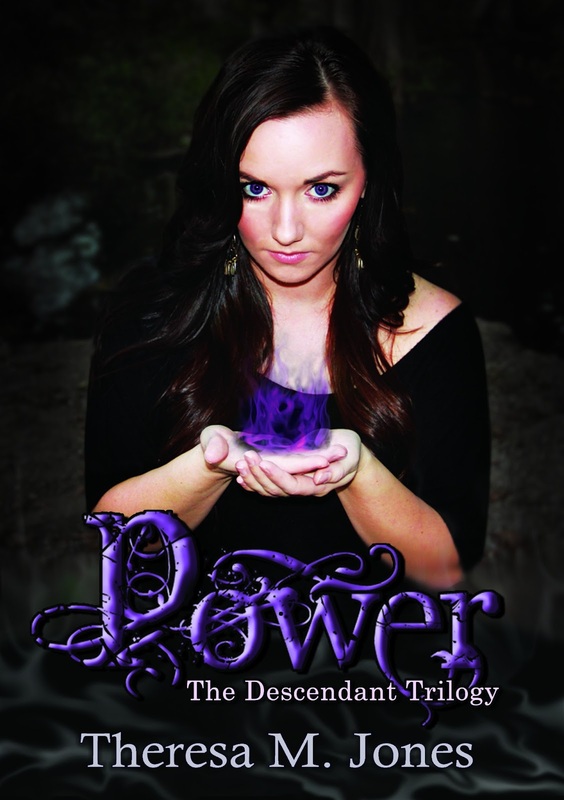 Today I get to share some awesome samples of Power by Theresa M. Jones. There’s also an awesome giveaway at the end of the post. Before I start, though, I just have two reminders. One is for the Word Master Challenge. Entries close on Sunday, but no one’s even entered yet. And it’s an easy one, I think. The other reminder: Please remember to vote for your favorite bloggers. You have until Thursday. Right! Now without further ado. Let me introduce you to Theresa and her new release. Theresa M Jones is just a regular small town, Texas girl. When she isn’t at work at a local Medical Equipment provider,you can find her at home with her husband and two beautiful (and rambunctious) kiddos. In her spare time- as if there ever was such a thing as “spare time” – she reads and reviews books on her book blog, and writes paranormal romance novels. I stepped outside into the fresh air. The sky was cloudless, and I could see all the stars. I walked to the pond and thought about putting my feet inside. It was summer, but we were high up in the mountains and the wind was chilly; so I decided against taking my shoes off and dipping my feet in the cold water. I snuggled my robe closer around me as I felt a small breeze. Being surrounded by massively tall cliffs, one would rarely feel a breeze out here, but when you did, boy was it cold. I sat leaning against a tree and looked out over the pond. I chuckled, “I guess it is morning already.” He offered his hand and helped me stand. I took it eagerly, and went straight into his arms. He didn’t pull away. If anything, he held me closer. It reminded me of the morning when I thought he would kiss me. After that morning he had distanced himself. But over the last few days he had gotten back to normal. He had even kissed my head and my cheek on a few occasions. Tonight I wanted more, though I was a little afraid to risk it. What if he started acting all weird again? I breathed in deeply, allowing his scent to fill my nose and my lungs. He nestled his head into the crook of my neck and I could feel the scruff from his beard scratch my cheek as he started to breathe deeply as well. I could feel his breath tickle my neck and it sent shivers down my spine. It made me pull him closer still. I could feel his muscles touching mine, and I could feel the heat emanating from him, warming my skin through my clothes. My heart started beating faster, and I felt my face flush with anticipation. He pulled away, just enough to look me in the eyes. I stared back into his, allowing him access to my soul, hoping he could see how desperately I needed him. I didn’t hold back at all. Before I could even react his lips were on mine. The heat that I had felt when he kissed my cheek, was like a lit match compared to the forest fire I felt now. Every inch of my body was deliciously ignited. This kiss started very slow. Tentative. Wary. Unsure. But as my lips parted, allowing him full access to me, things changed. He deepened the kiss. His arms pulled me closer to him, wrapped around my back, and held me firm. He tasted like heaven on earth. My arms were all over the place. On his face, on his neck, then down to his back. I couldn’t get enough of him. I couldn’t touch him enough, or smell him enough. Or… taste him enough. This felt right. Like the ultimate goodness. My body tried to inch closer, but it appeared we couldn’t get any closer. His chest was warm and hard against mine, and fit perfectly, as if we were two pieces to a puzzle. Who thinks this novel sounds amazing! Who’s read it yet? Also, who’s in for the Word Master Challenge this month?